The 1962 Seafarer Polaris owned by Holly Siegel. Knowing that there is hope for the boat, her landlords have postponed the deadline until January 31. 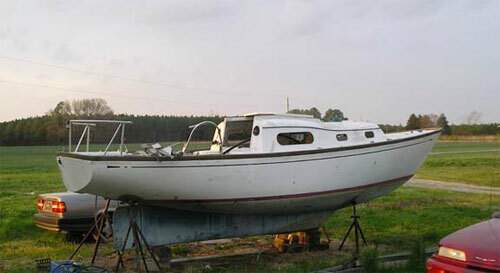 Her Seafarer Polaris is located in Delmar, Delaware, and is being offered free to a good home. This is the sort of project boat that might get a new good old boater started or it might be just right for you or another reader like you. At any rate, we'd like to take this opportunity to thank you for subscribing and to wish you a healthy and happy year ahead. Happy New Year from Karen, Jerry, and the Good Old Boat crew!